Top Five Advisor was founded in 2010 under the brand name TopFiveAwards. Started as a reviews website, it has since expanded its goals to include thousands of topics and it issues awards based many determining factors such as popularity, longevity, value, external reviews and more depending on the topic being covered. Top Five Advisor was founded by Scott Buehler, a digital marketing expert, who has created and maintained websites dating back to 1998. In 2010, he was operating over 50 websites and he felt pulled in too many directions. Starting that year, he decided to bring all of his review and helpful content sites under a single website. Since then, almost all of his personal efforts and writing are on the Top Five Advisor website with exception to his many clients that have hired him to help manage their digital marketing projects. Diamond Award – #1 Winner! The best in its category. Platinum Award – #2. The second best in its category. Gold Award – #3. The third best in its category. Silver Award – #4. The fourth best in its category. Bronze Award – #5. The fifth best in its category. Besides awards, we are also adding guides, training, YouTube video and more with ultimate goal to help people find answers to problems. One area that we’ve spent a lot of time on is our WordPress Training category that offers various WordPress guides, WordPress plugin reviews, WordPress theme reviews and more. We are definitely open to suggestion. If you’d like us to cover a certain topic or become one of our regular writers, definitely get in touch with your proposal. Although we do not accept guest posts, we do accept writers that are willing to write at least 4 posts per month. ► Version 1 (2010 – 2012) – This was based on a theme. Scott knew what he wanted but created a static iteration of a site so that he could better explain to his programmers exactly what he wanted in a custom content management system. ► Version 2 (2012 – 2014) – This was a custom PHP/MySQL system we had developed to run a reviews website sorted by topical subdomains. The problem we had with this system is adding content was very laborious, interlinking was very difficult, reviews were limited and to enter content in, we had to convert everything to HTML and then upload. This made adding images in our reviews (something we love to do) a giant pain. We ended up abandoning the idea of adding more topics because it was too difficult to manage. We needed a change. ► Version 3 (2014 – early 2015) – Around the middle of 2014, Scott made the decision to halt adding content to the site in an effort to convert the site to WordPress. This version was based on the StudioPress Genesis Framework and uses a customized Centric theme. At this point, we converted everything from subdomains to subcategories and spent 3 months manually moving the content (reviews, every submitted review, page content and more) over to a localhost WordPress network website. Meaning, the site was configured to be a multisite install with primary topics arranged similar to how we had it in version 2 except without subdomains. 100s of new features were added. Most of the advertising was removed. The site was now fully mobile-responsive so that it was easy to read on desktop all the way to small smartphone screens. A lot of great strides were made, adding content was now simple and we could start bringing on writers to help us add valuable content that the user will enjoy reading. This configuration with WordPress network install turned out to be a mistake. 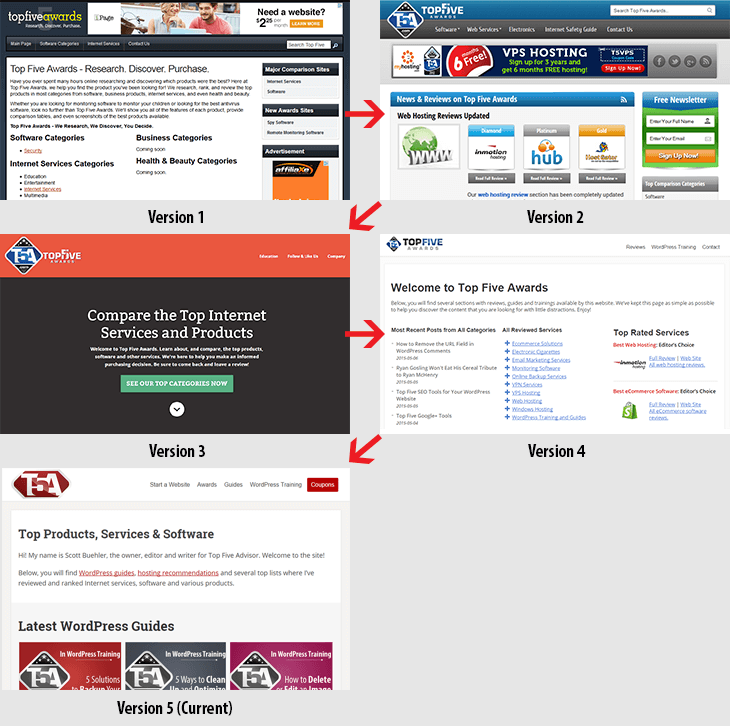 Although we were headed in the right direction, we quickly realized that the site was dominated with “here, buy this” landing pages, one per “site.” That’s how Centric is setup, the main page allows multiple sections for your content, but launching that arrangement on tens of sites was overkill. According to Google Analytics, users were “bouncing” from the site at over 93%. It turned out the bright orange header and dark background was alarming, the sales pitches were too “in your face” and people just left without browsing the content on the site. Back to the drawing board. ► Version 4 (April 2015 – July 2015) – Scott started hearing more and more about Thrive themes from his inner circle of digital marketing pros. After purchasing the license, he quickly realized that their themes were absolutely perfect for Top Five Advisor. Their themes were fast-loading, clean looking and offered some really nice features out of the box. So, he took the version 3 back to localhost, exported that data, imported it into a regular WordPress install, reorganized the categories, reorganized the tags (now called topics) and that’s where we are now. The site was moved from a KnownHost SSD VPS to WP Engine so that we could easily add a content delivery network that will help deliver our content quickly to users all over the world. Additionally, WP Engine is optimized for WordPress websites. By combining Thrive Themes with WP Engine, we were able to delete 6 plugins and further optimize loading times on the site. The main page is kept very basic for now as we add and revise content with the primary goal to help people make decisions. We’ve arranged several content sections on the main page so our readers can easily see what has been updated. Unlike traditional WordPress websites, we decided to keep the main page highly optimized with very few images. Now that our focus is the content, we want you to easily be able to find it in the categories that interest you. ► Version 5 (August 2015 – Current) – TopFiveAwards was launched with a new brand, Top Five Advisor with the site being moved to our short domain t5a.com. We also purchased TopFiveAdvisor.com and TopFiveAdviser.com which redirect to this new short domain name. This way, when our staff refers to Top Five Advisor, if someone types that name with a .com, they will land on the right website. With the new brand, we also launched two brand new sections. We had several readers ask us to compile our discounts and coupons on a separate page so they could see what current discounts we are offering exclusively through the site. We answered this request with a brand new exclusive coupons section. Besides coupons, we also launched a brand new awards section. This is where we are sharing are awards given to various Internet Services and software companies in various categories. We are going about our awards section differently by getting away from long confusing comparison tables, getting away from long spammy “top ten” horizontal lists and moving towards a fully compiled guide that shows 5 of the best services/products along with a noteworthy section that shares unique features that a company offers. Our goal here is to truly help the reader discover a service in whatever category they are interested in. These pages will be quite long and packed full of helpful information. Our goal is to update these pages frequently as companies offer new unique features. The site also went through a complete restructuring of data. Since we were moving domains, it was a great time to reorganize everything to make the site much easier to navigate. Prior reviews were removed from the standard blog section and placed under their respective “best of” pages. Now, our archive pages are far more useful because it doesn’t contain a blend of reviews, resources and guides. The main page has been drastically changed to highlight popular sections on the site, highlight our WordPress guides and offers a few exclusive promotions. Finally, we changed the color scheme from blue to red including the logo. We also streamlined the logo to remove the text and to highlight our T5A brand, which is also the website URL. That’s the history so far and we look forward to many revisions in the future. Want to write for Top Five Advisor? We do not accept “guest posting” here, however, we are always looking for people interested in being a regular writer that can contribute at least 1 post per week. Click here for information.